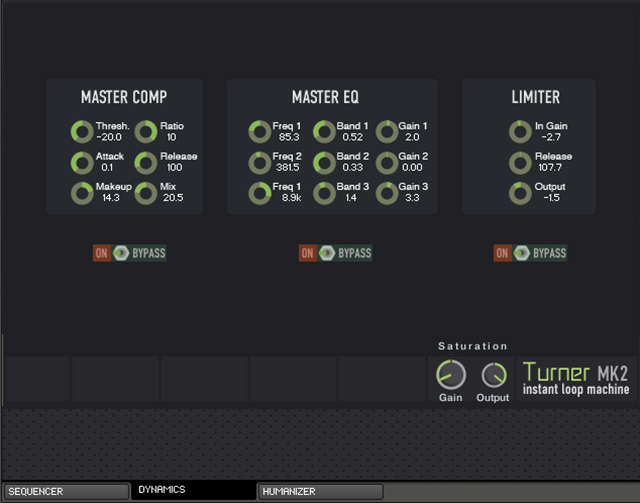 In this software review, Dubspot’s Rory PQ takes us through TURNER MK2 by SturmSounds-Electro. Get an in-depth look at this interactive beat machine, sampler slicer, and remix tool for Native Instruments’ KONTAKT sampler. TURNER MK2 by SturmSounds-Electro is an interactive beat machine, sampler slicer, and remix tool for Native Instruments’ KONTAKT sampler. This convenient instrument library is designed to inspire musical ideas and introduce new ways of sample-sequencing. Its vast array of features gives you the tools to quickly create complex loops or remix existing ideas in an intuitive layout that is extremely fun to work with. Easily transform sounds into new ideas with little effort or musical knowledge. 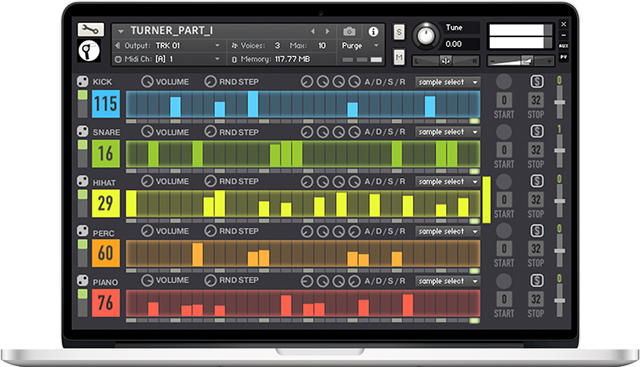 TURNER MK2 is a versatile software instrument that combines a unique sound engine architecture with a user-friendly layout that focuses on sample sequencing, sample slicing, pattern creation, and beat programming. 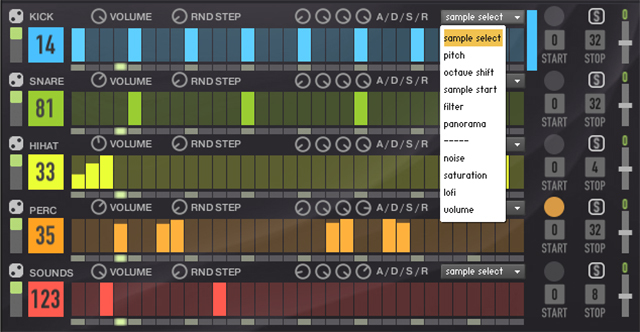 It’s essentially an all-one-one music creation solution for creating beats, melodies, and engaging sampling experiments. Working with TURNER MK2 is fairly easy to understand. There are five sequencers (blue, green, yellow, orange, red) that offer various options for tweaking the sound of a loaded sample, as well as audio effects to the process the sound further. Instantly discover new loop combinations by exploring the included sample library of urban electronic sounds, or import your own samples for unlimited loop creation possibilities. To get started using the included sample library, simply select a sequencer and either tweak the loaded sample using the various sound shaping options or choose a new sound to work with. The number box next to each sequencer contains 127 replaceable samples. The fader next to the number box allows you to select between two different modes that are controlled by the sequencers set bars. Setting the fader to the bottom will allow you to select the sample material by adjusting the height of any set bar. This option is great for quickly browsing through 127 sounds with a simple mouse drag. When the fader is set to the top, the sequencer set bars are used to control the volume of each step. For fast results click the Die button above the select mode fader to randomly generate different patterns. The Die button also allows you to randomly generate settings for pitch, sample start, volume, and various effects. Once you have a sequence playing, you can begin shaping the sound further using the various controls along the top of each sequencer. The VOLUME knob controls the output level for each sequencer. The RND STEP knob will randomly change the playback position of each step. This function is great for introducing some random variations of a pattern. The A/D/S/R envelopes allow you to adjust the Attack, Decay, Sustain, and Release of the sample. Finally, the Parameter menu offers different options to adjust various pitch modes, octave, sample start, filter type, panorama, and effects such as noise, saturation, lofi, and a separate volume control. Below the sequencer section is a variety of options for applying additional audio effects, adjusting modulation, capturing scenes, setting the tempo, adding swing, generating random sounds, and controlling various other functions. This button will randomly generate sounds and patterns for all five sequencers. This option is great for quickly finding sounds and discovering new ideas. The send effects section offers controls to send delay and reverb to any of the five sequencers. Simply select the track you wish to send the effect too from the menu and then adjust the various options to fine tune that effect. The Freeztempo function is used to stutter the global output. The Hold Step knob is used to essentially freeze and hold a step while the Step Position and Tempo knobs allow you to change the position of a step and change the tempo of a held step. Quickly capture individual patterns, and save up to ten captured scenes that can be triggered using the 10x buttons. The Capture menu located next to the buttons is used to load captured scenes or assign them to any of the ten buttons. In addition, all the buttons can be mapped to any MIDI controller or automated within your DAW of choice. 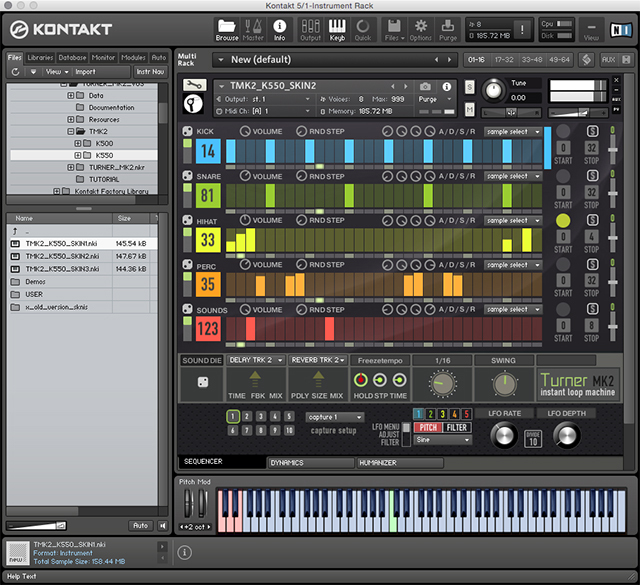 The captured scenes can also be played via the colored capture keys in KONTAKT. The Global Adjust Switch allows you to switch between global modulation, tuning and stereo spread, and filter settings. Setting the switch to the top gives you access to LFO options that allow you to modulate the pitch or filter frequency of any sequencer track. Setting the switch to the middle reveals controls to make fine adjustments to the tuning and stereo spread. Setting the switch to the bottom gives you access to adjust the global filter types and apply a Lofi audio effect. Towards the bottom are three tabs: SEQUENCER, DYNAMICS, and HUMANIZER. The SEQUENCER page displays all of the instruments sequencer tracks, sound shaping parameters, audio effects, and global controls. The DYNAMICS page gives you access to an SSL style compressor, three-band solid state EQ, a limiter, and saturation controls. Finally, the HUMANIZER page offers additional controls to adjust the timing, tuning, and volume of the overall output signal. TURNER MK2 is available to purchase from the SturmSounds-Electro Shop.